This is part one of a three part series on why newswires are bad for your brand, part two is here and part three will be posted soon. There have been a plethora of mediums favored for circulating news: Newspapers in the 18th century, radio and television in the 20th century, and the internet in the 21st century. Before the printing press was invented, word of mouth was the primary source of news. While the idea of recording news has been around since the age of scribes, disseminating global news has its start in the 19th Century. In France, Freedom of the press was first guaranteed under Article XI of the Declaration des Droits d'homme in 1789. Afterwards, the country saw a sudden increase in the number of newspapers and periodicals available with around 1,500 appearing in the first six months. However, the need for local – and global – news also grew. Created in 1835, the Agence Havas was the world’s first news agency. Founded by Charles-Louis Havas, the company collected, translated, and distributed news to fill this need. It would later become Agence des Feuilles Politiques - Correspondance Générale; and in 1852, would launch its own advertising division. Under German-occupancy, the information service was transformed into a propaganda dispensary during World War II. Regaining its status as unbiased and objective news source after French liberation in 1944, the company was rebranded as Agence France-Presse. Today, the AFP still enjoys a solid reputation as one of the world’s top three leading news agencies. France wasn’t the only country interested in global information… nor the only news source plagued by government meddling or war-time propaganda. At the beginning of the 17th century, the right to print was strictly controlled in England. This limited the access of newspapers in the UK. As British rule lessened its grasp on publishing, newspapers and information flourished. The increasing popularity and influence of newspapers was problematic to the then-government. In hopes of reining in editors and even putting publications out of business, parliament proposed a tax on newspapers. The journals that survived soon saw their numbers increase. This has later been attributed, however, to corruption and the political connections of their owners. In the 18th century, purely political journals continued to be printed side-by-side with papers devoted to domestic and foreign news and commerce. However, John Wilkes created the North Briton in 1761 which promoted freedom of the press, and just a few years later in 1772 the right to publish parliamentary reports was established. Newspapers increasingly made their profit from selling advertising. In the 1850s and 1860s, the ads appealed to the increasingly affluent middle-class. Political parties and trade unions throughout the country had long sponsored their own papers, but still had ties to other publications including The Daily Telegraph’s consistent Liberal Party allegiance and the trade union’s first daily newspaper, Daily Herald, supporting the Labour Movement. Journalism in America did not occupy as high a place in public regard as it did in England and France. America saw a great increase in rapid news gathering. With its invention in 1844, the telegraph quickly linked all major cities to a national network that provided news, ultimately transforming how news was gathered. In 1848, the Journal of Commerce, Courier and Enquirer, Tribune, Herald, Sun, and Express formed the New York Associated Press (AP) in order to obtain news for its members. This joint venture spawned other local, state, and national associations. The AP became the dominant agency for distributing news. Cities including Chicago, Cincinnati, New Orleans, and St. Louis used AP dispatches for internal dissemination of national and international news. The need for social and societal changes – from prohibition to the political status of women to abolition – also brought deadly consequences. Periodicals and editorials surrounding slavery – known as the abolitionist press – when they weren’t excluded from circulation or prohibited in the South, led to editors being assaulted, offices destroyed, and in some cases like that of Elijah Lovejoy were murdered by angry mobs. Previous to the First World War, immigrant communities enjoyed publishing freedoms and rights where political and religious interests could be promoted in familiar languages. This all changed, however, once America entered the war. 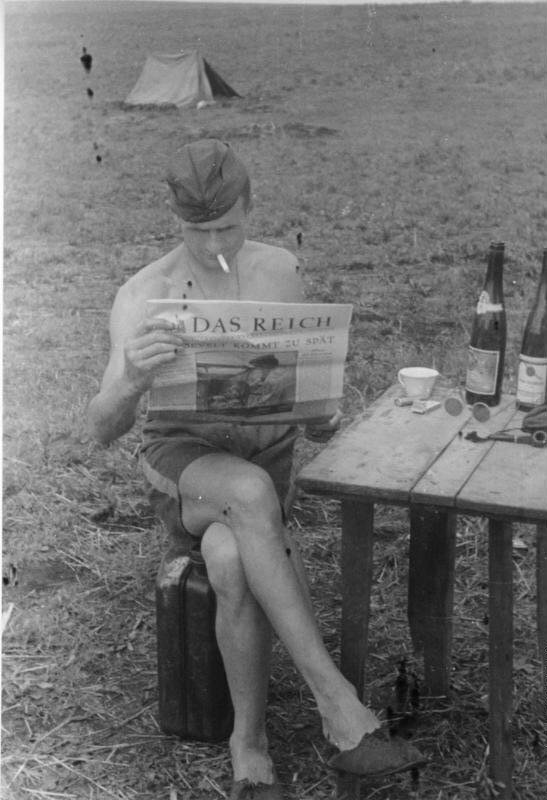 Anger was focused at German newspapers – with over 1,000 published annually – as supporting Germany in the war effort. In October 1917 Congress passed legislation stating that foreign-language newspapers must translate all material concerning the war. Almost every German paper folded during that time. By the 1950, foreign language papers had completely stopped. As news disseminated and became common good so did advertising. This industry flourished and caused the specialization of the production of ads. 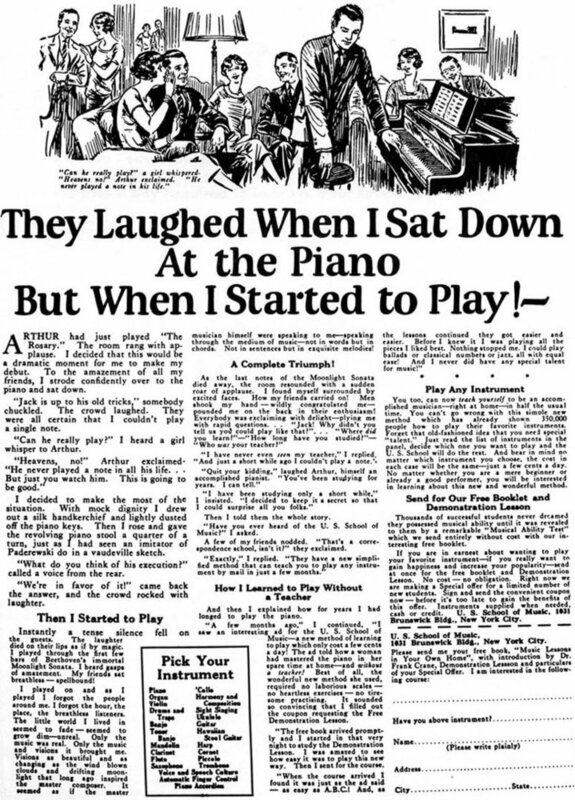 One seminal moment was when John Capels wrote an advertisement for self-taught musical courses as can be seen below. Words cannot be unsaid. Nor can printed materials be unpublished. As was the case for William Henry Vanderbilt when he told a reporter in 1882 that “the public be damned” with regards to the railroad’s monopoly and customer kickbacks. Vanderbilt’s words landed on the front page of hundreds of newspapers and inspired endless editorials. This was one of many instances that led to businesses keeping information – especially that with negative consequences – away from the public. As the father of modern public relations, Lee, created the “Declaration of Principles” stating that the press and public should receive accurate and timely information regarding a company’s actions. In 1906, he put those principles into action. 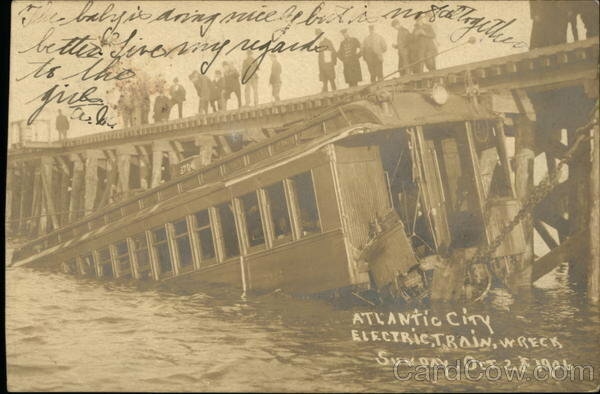 A train belonging to the Pennsylvania Railroad derailed off a bridge in Atlantic City, killing more than 50 passengers. A former Times reporter, Lee invited the press to the scene to cover the accident first hand. 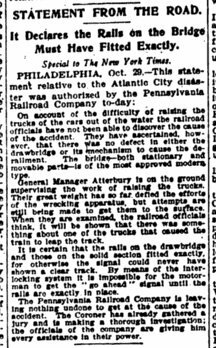 To assure the press had accurate information, he wrote about the tragedy which was later printed verbatim in the Times. This statement was the predecessor of the modern press release. Press releases were created so companies could let journalists know important information such as launching a new product, winning an award, partnering with a significant company, or in Lee’s case – crisis management. It’s not just businesses, though, that use public relations to control audience perception. When the First World War started, various governments created their own organisations to generate propaganda towards enemies, allies, and even their own citizens. 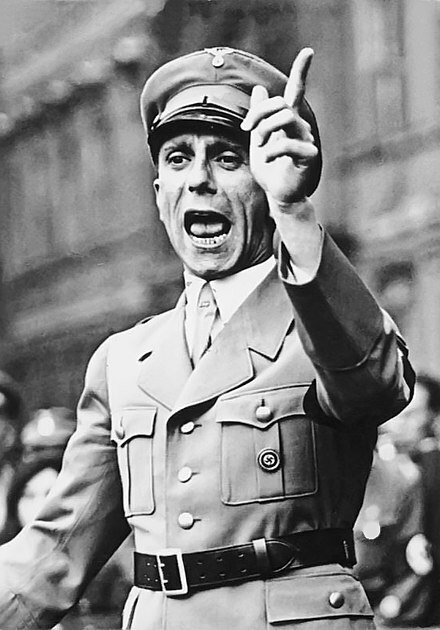 During the Second World War, Joseph Goebbels headed propaganda movements via pamphlets and reputable information sources for Hitler in support of the Nazis regime. Across the pond, the US created the Office of War Information to censor war news and create a central hub to communicate about the war, limiting access of the press. And long before David Ogilvy became an advertising tycoon he was actually a British spy, trained at Canada’s famous secret Camp X. Tasked with ruining the reputations of Nazi supply chains, "there he mastered the power of propaganda." The industry became more focused on the connection between social psychology and human influence thanks to Edward Bernay. Nephew of Sigmund Freud, this pioneer of public relations was instrumental in defining goals and strategies within the industry. His campaigns relied heavily on persuasion tactics. While this has led to a negative connotation when it comes to PR and spin, contrary to popular belief, his theory of PR integrated the public’s experience and perception. Today, the idea behind a press releases is that it’s sent to a plethora of media outlets in hopes that one or more of them would contact the company for more information in order to cover the event. As people moved online, so did the press release. This made it easier for companies to write them. No longer are they reserved for large, notable events, but now everything from new hires to office redesigns. From 1860 until 1910, Britain enjoyed a “golden age” of newspaper publication with technical advances in printing and communication combined with more partisan journalism. As demand for news increased, so too did the need for the specialised production of information. 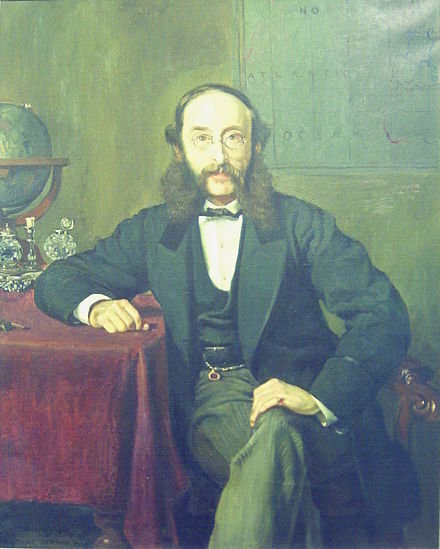 It was roughly this same time that Paul Julius Reuter founded the Reuters News Agency. Headquartered in London, the company initially covered commercial news, serving banks, brokerage houses, and business firms. Reuter's agency built a reputation in Europe and the rest of the world as the first to report news scoops from abroad – from the Berlin Wall to foreign-exchange rates. The news agency is regarded as "one of the world's major news agencies, supplying both text and images to newspapers, other news agencies, and radio and television broadcasters." In the early part of the 20th century, American publisher E.W. Scripps founded the first national newspaper chain. 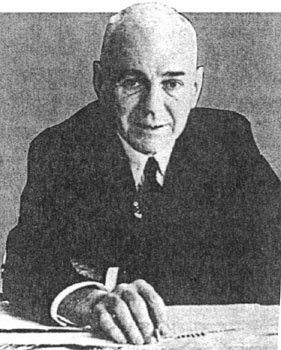 To syndicate services based on product differentiation, he developed the United Press (a national wire service), the Newspaper Enterprise Associations (supplying news features), and other services. A man can do anything he wants to do in this world, at least if he wants to do it badly enough. Companies like Reuters and E.W. Scripps were successfully generating news centrally and selling them to media companies. As such, commercial newswire services, also known as alternative media, spun this model into one for publicity – offering to distribute company news to agencies, journalists, and other businesses. As everything went online, newswire services began syndicating press releases more widely than ever before and across hundreds of sites simultaneously. In many ways, this – coupled with the creation of low quality releases – was the beginning of information overload. It’s not just getting lost endless noise that’s harming companies who use newswires; it’s also that these services often overstate the size of their journalist databases and the reach they offer. What sounds like a solid selling point is rather the antithesis of public relations – and actually harms your brand. We explain this further in part two: Why using newswire services harm your brand. Be sure to sign up for our newsletters and be one of the first to learn why this is and how you can reach your audience without doing a disservice.